Flashback to E3 2002, Los Angeles. BioWare had set up a preview booth that I would pass by each morning, just after the escalator up to the aircraft-hangar-huge main hall. On their monitor was a looping video of Star Wars: Knights of the Old Republic and a few employees leisurely manning the booth. That first morning of E3, I stood and watched the video--and came away confused, wondering exactly what it was I was viewing at and what type of RPG they were shooting for. Stuttery with an average framerate at best, it looked for all intents and purposes like another hybrid 3D action/RPG, and my thoughts turned elsewhere. That is, until last spring, when the Xbox version was released. Funny how first impressions can often be so right, and then again in the end. . . . It's not because I'm a Star Wars fan that I adore the game. That's a misconceived rumor surrounding every major Star Wars game released--that you must already enjoy Star Wars to be a fan of the product. Or worse, to even understand. The great thing about the Star Wars universe is that at its base lay the struggle between "good" and "evil," and that's something we all can understand. The same applies to KotOR. The game envelopes you in its overall evil dictator plot, so simple that small children will pick it right up. Then it re-emphasizes the good vs. evil approach by allowing you, at all points in the game up to the very end, to choose (mostly through conversation) which point on that continuum you rest. Where you are on that light/dark continuum influences not only non-player characters' (NPC) reactions toward you, but your own party members' reactions, and the magical abilities known as force powers, all throughout the game. It's that consistent freedom to choose that is the foundation for the gameplay found in Knights of the Old Republic. For those with little previous role-playing experience, the d20 ruleset--a system using only a single 20 sided dice for chance rolls--the game is based upon may at first seem a little daunting. Thankfully, KotOR does a commendable job at catering to both experienced role-players and those who are new to the genre by providing mouse-over text help at any time, and adds the very useful Auto Level Up and Recommended buttons for those who care less or are at first intimidated by stats. In other words, it attempts to cover all its bases and in general, succeeds brilliantly. To begin the game, you're taken to a screen with three choices each of male and female character templates: the rogue-like Scoundrel, who's more dependent on diplomatic conversation choices and ranged weaponry at the beginning than on a melee weapon; the Soldier, who is built with more fortitude and less finesse; and the Scout, somewhere in between the two. All that's required is that you choose a template, portrait and name (with a nice random generator included), and you're set to begin your adventure. For those who wish to tailor every aspect of their character, the game provides this experience as well; simply choose the custom option and you'll be able to allocate all of your primary stats and assign feats and skills. It should be mentioned that at every subsequent level up you're always given the auto level up and manual options, a thoughtful way of handling it. Throughout the game, several NPC characters will join your party and level up along with your main character, and the auto level up button can be occasionally useful. The tutorial intro sequence is well done--KotOR takes into consideration the recent design paradigm of throwing players right into a hand-held piece of the action to start the game. It is exciting for the new player with just the right light touch of danger, and provides an opportunity to completely learn the ropes without attempting to cram it all in at once. 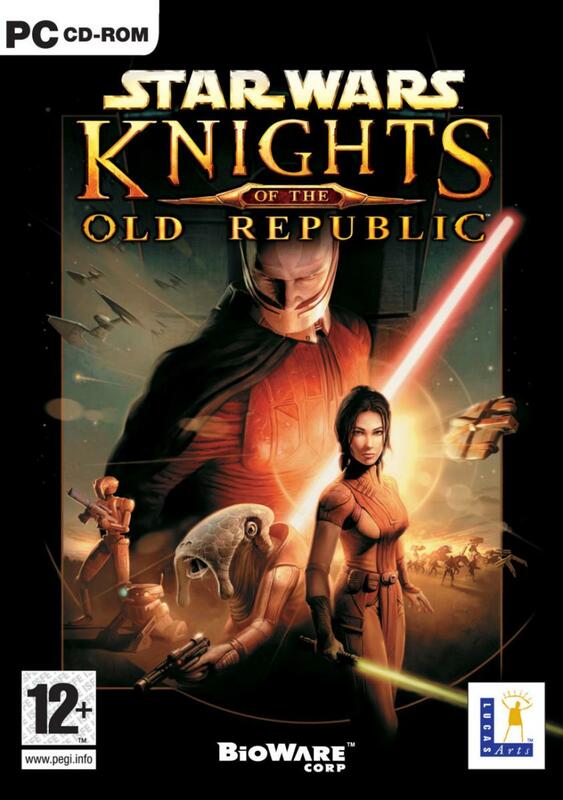 By the time you've finished, you'll be ready to explore the first of the many vast worlds that are included in KotOR. Thanks to the spaceship, the Ebon Hawk, you're able to travel to several of them during the course of the game, and not all are initially available. With the interior of the ship open to you and your party, the FMVs between worlds and the short space battle sequences, these factors lend an appropriately grand and epic feel to the game, which compliments the overall good vs. evil, fight for humanity story nicely. BioWare did an admirable job with the Xbox version of the interface, and have thankfully taken advantage of some of the PC's strengths, only improving upon the design for the PC version. On the plus side, PC users get to enjoy re-mappable hotkeys for nearly all of the functions (though they could have been slightly more generous), a completely different cosmetic look than the console version making efficient use of screen real estate, and one that works with the middle-mouse button for scrolling through inventory. The only downsides to the new interface come merely in the area of neglect; though it would have meant more programming, a quick weapon-switch hotkey for at least two weapon configurations would have been extremely helpful. This is something I also wished of the Xbox version, as many times throughout the game, you'll be switching from Lightsabers to normal melee vibroblades, and again to ranged weapons. That said, I still prefer the PC version of the interface for its speed, use of the mouse, adaptable configurations and sleeker, more efficient look. Through conversation, narrative and dramatic events, Knights of the Old Republic brings us it's epic story, usually one of the hallmarks of a good RPG. From the escape sequence at the beginning to numerous plot twists by the end of the game, the story in KotOR does its best to live up to the original Star Wars films. In many ways, though, the worlds contain enough lore, good writing, dialogue and believable plot twists to surpass even Mr. Lucas's vision. It's that good. The characters you meet all have their own past and you'll establish a certain rapport eith each of them, taking the relationship in some cases as far as you'd want. When you're finally finished with this long game, you'll probably feel like you finished another great book in your favorite series. It is rare for a game to hit upon the right balance of freedom of exploration and guidance, but Knights of the Old Republic nails this aspect. There is never a time when you will lose a grip on your direction, thanks to the consistently updated and helpful journal. And yet at all times there will be so many options for you, worlds to explore, quests to cash in on, mini-games to play, that you'll likely be glued to your chair far longer than you initially sat down for. In fact, once you've chosen a general direction down the dark path or light path, it's almost inevitable that you'll actively seek out those opportunities to add or subtract to your place on the continuum, and excitedly check your character's profile to see their new standing each time you see the words "Light or Dark Side points gained." One of the best aspects to KotOR is that nearly every encounter presents a way to earn these so-called Light Side and Dark Side points. Thankfully, the ways in which you earn Light Side points is not always obvious and takes some amount of figuring out. Unfortunately, the same cannot be said for earning Dark Side points, as the appropriate answers during conversations are perhaps a little too obvious, too often. It would have been nice if they would have made subtler approaches to playing on the Dark Side, rather than the frequent personal affronts and physical attacks. To the game's merit though, the countless ways to achieve points in both directions leads to almost limitless gameplay in this area of character development. Length is another area where the developers did not skimp. This is an RPG, and BioWare has lived up to their reputation of providing solid gameplay throughout countless hours of gaming. My first time through the game, I spent over 17 hours on the first planet alone, with over five more worlds remaining, though admittedly not all worlds are equally as long. As a bonus, the PC version of the game includes a new location--a small space station orbiting around the planet Yavin, not currently found in the Xbox version, complete with a merchant who restocks his high-quality inventory at various times throughout the game. Take all of this and add two mini-games that add even more gameplay: a moderately complex Blackjack-like collectable card game, and the mostly optional Swoop Bike racing. During a game of such scope, both in length and story, it would have been a tremendous disservice if the graphics weren't able pull their weight. How much exactly does anisotropic filtering and 4x multi-sampling really mean to graphics? To the overall effect, thankfully, only so much. It's the artistic vision that lends a game most of its graphic punch, and 100x anti-aliasing can do little for bad art. To its credit, the PC version of the game (and to a lesser extent the Xbox version) actually makes use of those phonetically-awkward technogeek graphic capabilities, but it's the art on the screen that captivates, and the diversity of art and expression seen in this game is nearly unparalleled. Every world has distinctly different architecture reminiscent of Bethesda's game Morrowind, but tops that well-done RPG to include other-worldly terrain, organic and non-organic enemies, and alien NPCs in its repertoire. It's both exciting and visually stunning to touch down on a new planet and exit the Ebon Hawk's gang plank for the first time. There is one point later in the game where you might be wondering, as I did, just how much imagination the game could possibly have left to throw at you. Then, suddenly, you'll find yourself on a new world with completely different terrain, shake your head a couple times, and then nod, because the game has just reaffirmed your choice to give up 50+ hours of your life to it. Here's an incomplete list of environments to provide a glimpse of the diversity of locals featured in the game: cantinas, deserts, foggy deep forest, treetop villages, underwater sea stations, spaceports, caves, dungeons, tombs, schools and wide open grasslands with wild beasts. In the Xbox version, there were several times I found myself seeking better views of the gorgeous vistas on several of the worlds, and it only gets better on the PC version. Details that at first weren't evident to me on the console, are fleshed out in striking contrast thanks to the higher resolution, more detailed textures, and especially the draw distance. Either they have increased it for the PC, or distant details were simply a blur in the console. At a respectable 1024x768 resolution on the PC, it was like I put on glasses for the first time and could read the writing on the far wall. Take a look at the screenshots to see what I mean. Another striking difference between the console and PC version are in the facial details. Apart from the higher resolution in the PC, you can now make out wrinkles, laugh lines and facial hair on many of the NPCs, and the veins and vivid color for Dark Side characters are more defined as well. I made it a point to use the same portrait for the PC that I picked during my first time on the Xbox version, and the differences were comforting: more realistic facial features and less like paper mache, which was one of the minor complaints I had against the Xbox version. Yes, they got it right. I'm referring to the two most important sounds in a Star Wars game: the sizzling hiss zang sound of powering up the lightsaber followed by the sub-sonic vibrating hum, and the musical score. It's all just like in the movies but better; by pressing the X key, you can take out your lightsabers and twirl them around until you pass out. The interesting thing about the music in KotOR is that it actually takes a back seat to the sound and voice acting. That's right, finally a Star Wars game where the developers do not use the music as a crutch to lift up the sagging gameplay. In fact, it's so subtle and atmospheric sometimes that it becomes refreshing to hear when it does stand out, such as in the Ebon Hawk cinematics while zipping around space-time. Perhaps the most amazing thing about the game, graphics, gameplay and all, is that every word of dialogue in the entire game is voice acted. As far as I know, in a game as long as this, it is a first. Be prepared to free up 3.5 Gigabytes of space on your hard drive mainly due to this fact. But that's not all. It's also exceptionally done. All of it is, truly a monumental feat. Even the aliens sound authentic, though a large portion of the total dialogue is probably from alien speech and won't make much sense to English-speaking people; but that's when the subtitles come in handy. The quality sound effects you'd expect from a Star Wars game are also present and accounted for. Authentic-sounding blaster shots, character echos when in cavernous areas, the familiar beeps and whirls of droids, and the list goes on. With just three classes to choose from at the beginning, it may appear that the replayability in the game is potentially lacking. As I found out in my short viewing of KotOR at E3, first impressions can be misleading. During the course of the game, you'll choose to become one of three new classes of Jedi, each substantially different from each other in abilities and force power point consumption. Now take into consideration the freedom to choose between the well-balanced Light & Dark paths, each with their own unique arsenal of force powers. Then tack on nine NPC party members throughout the game, including two droids. Each of them has their own storyline, quests (well, most of them), and unique leveling options. Finally, consider the length of the game, and that nearly all quests and encounters have both a light and dark solution, and you'll see that there is much room for replayability. That's really just the half of it, though. Through the combat in the game and manipulation of the game world, both in persuasion and espionage, you'll really get a sense of how your choices in character progression are playing themselves out. This is especially true in combat. Each new force power and feat you choose has usually a dramatic effect on how you play. Watching your characters in battle is just plain satisfying and fun. By the end of the game, you'll likely be curious enough about the other force powers you missed during this play through, and especially at how the other side of the force will play out during the major quests to warrant another play through. If that's not enough, you'll get one very different satisfying ending for each the light and dark side. To tell the truth, this is one of the few RPGs I have replayed several times. It's that fun. Thankfully, many of the Xbox-related bugs and issues have been worked out, but some still remain, and of course a few other issues related to the PC have surfaced, though only two to my knowledge affected me in my play through. The transitioning between FMV movies was too long for my tastes, much longer than in the Xbox version, and I have a fairly fast computer, well above the recommended specs. The load times in general, though, were immensely better than on the console. I have also experienced some random graphic stuttering, which both came and went sporadically throughout the game. Overall, apart from the occasional stuttering with my 2.4Ghz Ti4600, 512mb RAM machine, the framerate was silky smooth in most places, with 2x anti-aliasing, anisotropic filtering and all other options checked. Of all the places, I would say outside in Taris, your first major location in the game, was the worst for stuttering. I would give it some time to smooth out if this happens to you. Additional changes I would have recommended the PC version implement would have been a quick weapon switch function, an intelligent interface that remembers your last feat used or the one used most often during combat, and defaults to that, instead of requiring the user cycle through to the appropriate one much of the time, and re-mappable mouse buttons. The manual that comes with the PC version is spiral bound, well laid out, and includes many useful charts for character progression and alignment at the back that weren't included in the Xbox manual, a definite plus. It's very rare for a game to be strong in as many ways as BioWare's Star Wars: Knights of the Old Republic, and refreshing to play one that has found its own style and succeeds. From the brilliantly executed Light vs. Dark approach, to the superb voice acting and rich, immersive worlds, KotOR feels like a tour on a pleasure cruise from start to finish, visiting foreign ports and finding adventure. It is an RPG that now stands with my very favorites, for its own unique reasons. One does not have to be a Star Wars fan to enjoy it, and I would eagerly recommend it to anyone looking for a gaming adventure. It's as much that as it is an RPG, combining the right mix of storytelling, danger and RPG elements. The bottom line: there is enough game here to justify the purchase of the gaming rig that plays it.